No one embraces new talent, new television show like the Golden Globes. Considering they’re not a critics group like the Television Critics Association (who always have great TV picks) it’s impressive how willing the Hollywood Foreign Press Association is to reward new and emerging talent. This year is no different with first-time nominees abound and freshman shows healthily represented. But there is a double-edged sword to that as the group also sometimes bestows its highest honors one year only to snub it the next. That definitely happened this year with last year’s Drama Series winner Mr. Robot not even getting a nomination (although stars Rami Malek and Christian Slater hold on) to Supporting Actress winner Maura Tierney (The Affair) and Leading Actress in a Drama Series winner Taraji P. Henson (Empire) both missing out. In fact, in that category, only one returning nominee exists – Caitriona Balfe for Outlander. The other four are brand new. The Golden Globes will air live on Sunday, January 8th on NBC at 8pm EST/5pm PST and will be hosted by Jimmy Fallon. 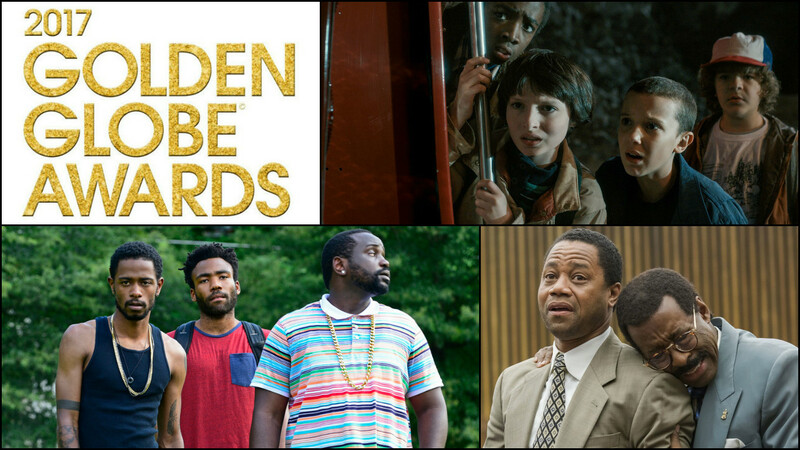 Here are my predictions for the 2017 Golden Globes – Television. Four of the five nominees are freshman shows and no one likes rewarding new television and new talent than the Globes. The Crown might be the more prestigious choice but Stranger Things and Westworld are certainly more buzzy and of the moment. Although, This Is Us is NBC’s first nomination here in a decade and that’s nothing to shake a stick at. Every nominee also has at least one acting nomination to boot, making it extra tough. The lone return nominee, Game of Thrones, has never won and it’s taken the Emmy for Drama Series two years in a row now. Could it be its time? I’m going to go with Stranger Things for the win but with Westworld as a very possible spoiler. Mozart in the Jungle broke from the Golden Globes’ tradition of rewarding a new program only to be snubbed the next year. That said, Atlanta is the only new show here and it’s probably going to win. The People V OJ Simpson: American Crime Story should have no problem repeating its Emmy success here. Sarah Paulson should take it but watch out for Riley Keough to spoil. A tougher, and better, lineup than the Emmy version. Courtney B. Vance should still be able to triumph. So many new choices make this a very difficult category. Three actresses have corresponding Drama Series nominations. I’m going to go with Winona Ryder (a previous Golden Globe winner) for two reasons; I’m picking Stranger Things to win Drama Series and this is a major comeback narrative for her. She’ll get a standing ovation if she wins. If it’s not Ryder then Claire Foy will probably take it. An interesting category as three actors are previous nominees here (Malek, Odenkirk, and Schreiber), one is a first-time nominee for an existing show (Rhys) and just one from a freshman series (Thornton). Golden Globe logic says Billy Bob Thornton will probably win but maybe Malek follows up his Emmy win here. Interestingly, none of these nominees come from shows nominated for Drama Series. I’m going with Thornton but with Rhys as the spoiler. This should be between Issa Rae and Sarah Jessica Parker with each having new shows. Rachel Bloom and Gina Rodriguez have both won here for the first seasons of their show. Julia Louis-Dreyfus has amazing never won here for Veep despite a stunning five-year streak at the Emmys. Tracee Ellis-Ross is a first-time nominee here and I can see either her or Rae taking it. Donald Glover should be able to win this but watch out for Nick Nolte as a spoiler. Another tough category but I see Thandie Newton taking it. One of the This Is Us ladies could spoil and if I were to choose I’d say Chrissy Metz. Can Sterling K. Brown repeat his Emmy win? Does his appearance in the three-time nominated This Is Us help him? I say yes and yes. As long as it’s not John Travolta we’re good.